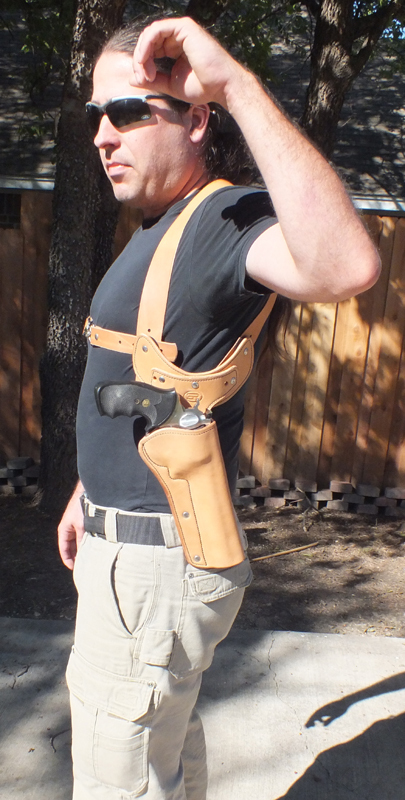 This summer, I made the decision to have a custom shoulder holster made for the .44 Magnum Ruger Redhawk revolver that I use for feral hog hunting. In the past, I’ve tried a variety of holsters in many different configurations for the Redhawk, both with a scope and without. None of them seemed to work well. Most were ill-fitting nylon affairs, and even these “universal” holsters were difficult to find in a reasonable configuration to accommodate scope perched atop the revolver. I had been evaluating a number of hunts from years past, and after going over my notes in detail (you do take notes about every shot while hunting, don’t you?) I determined that most of the shots were taken from less than 100 yards away, with a significant number of them falling within 50 yards. I figured that if Elmer Keith could hunt medium and large game out to 600 yards using only a magnum revolver and fixed iron sights, then I could do so at much shorter ranges. I took the scope off of the Redhawk and contacted Michael from The Holster Site to commission a custom shoulder rig for my Redhawk. After contacting Michael, we met up, and he took some measurements while we discussed the particulars of what exactly I was looking for in a shoulder style hunting holster. The biggest problem that I had was the size of the gun. 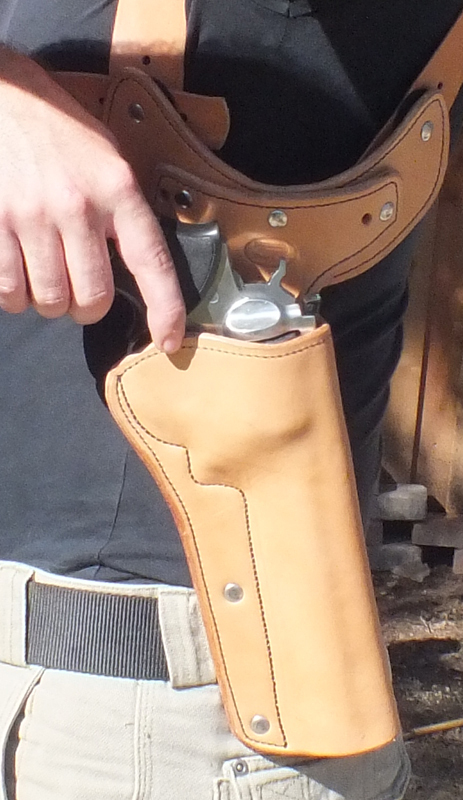 My Ruger Redhawk has a 7 1/2″ barrel, which is just bordering on “too long” for a shoulder holster. A 90 degree vertical holster would leave the muzzle far too low below my belt, so we went with a hybrid setup that had an adjustable cant, initially set at 75 degrees from horizontal. This angle allows for the long barreled revolver to be comfortably carried without impeding natural waist movement, while still enabling a safe and rapid draw. The other problem was the weight of the gun. Other holster setups I had tried carried the gun only, and this left my body unbalanced with the weight all on one side. Carrying an unbalanced load inevitably led to back soreness as my muscles compensated for the additional weight. 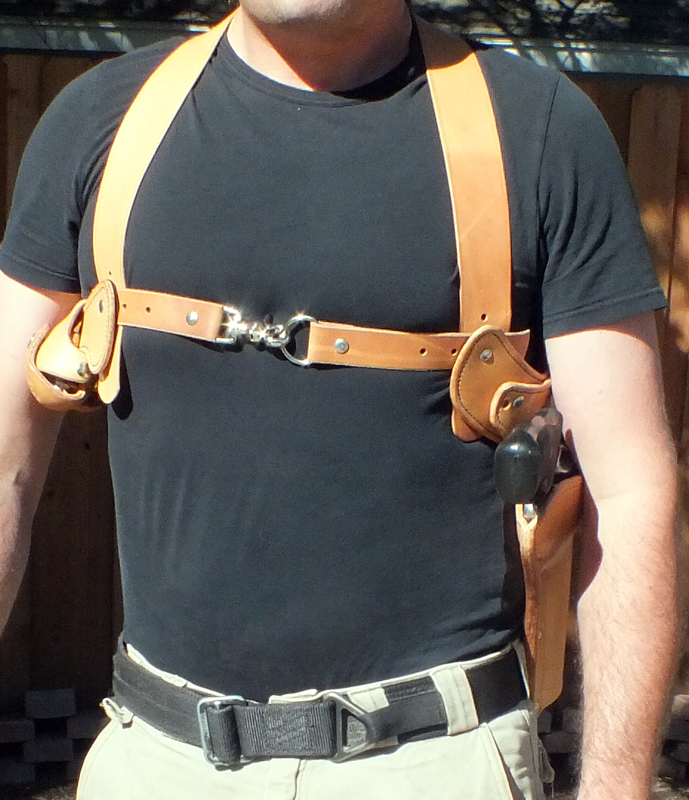 The natural solution in a shoulder holster is to add reloads to the off-hand side. Not that I really need reloads for a hunting setup. Even hunting wild hogs, it’s rare to get off 6 rounds at a herd as they tend to make themselves scarce quite quickly after the first shot. Michael added two pouches to the right side of the rig that are custom fit to accommodate HKS 29-M speedloaders. The weight of the pouches combined with the speedloaders and 12 rounds of ammunition don’t quite offset the weight of the massive handgun, but it does help to balance out the harness. Normally, the holster making process is pretty straightforward. Michael takes a dummy gun (which he has dozens, if not hundreds of) and models the holster around. The massive Ruger Redhawk isn’t a gun normally carried in a holster, relegated I suppose to life as a safe-queen and toted about in a case or range bag on the rare occasion that it leaves the house. As such, Michael didn’t have a model upon which to base the holster shape. Instead, I left my .44 Magnum with him while he made the shoulder rig for it. Soon enough, I got an email indicating that the holster was ready and that I could come pick up my revolver and its new leather carrying harness. My travels had taken me up to far northern North Dakota however, and the holster was over a thousand miles away in Oklahoma. Michael was fine holding onto it a while. He even set up a nice hospice to care for the stainless steel hand cannon along with a few of its .44 caliber brethren. Eventually I made my way back south and swung by to pick up the new hunting holster. Michael made some final adjustments to the fitment, including the last-minute additions of a tanker-style chest strap to keep the weight of the revolver and two reloads from swinging back, and a belt loop at the bottom of the holster to keep the muzzle from swinging out. This way, I could duck under low hanging tree branches and shrubs, climb up to a tree stand, or leap across small creeks and streams without worrying about the large and heavy Redhawk flopping about. The primary advantage of a custom holster is that it fits like a glove. 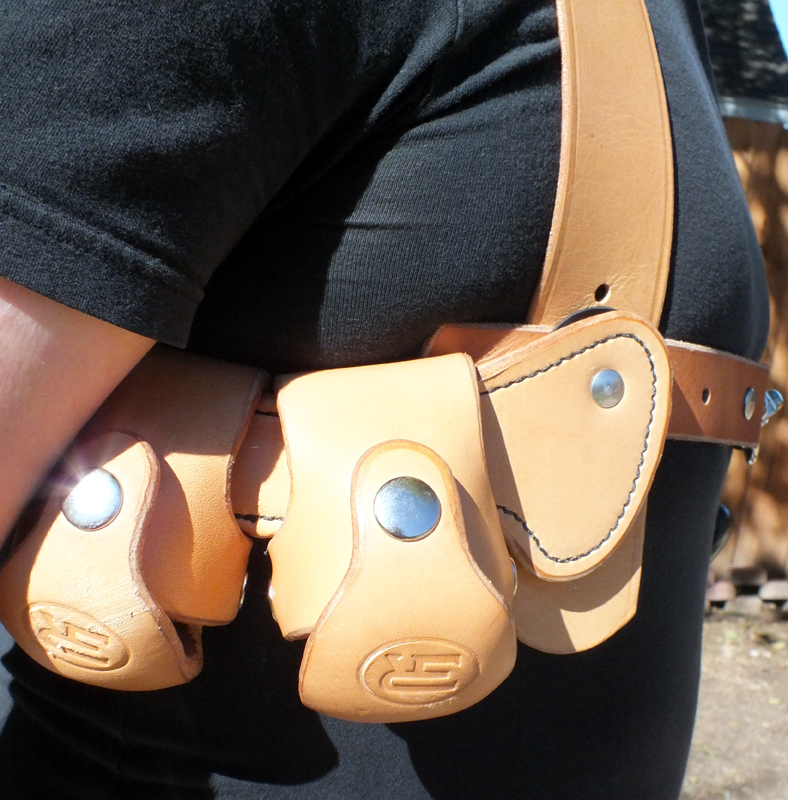 The custom fit virtually eliminates rubbing and chafing that plagues universal-fit nylon and leather shoulder holsters. The balance and weight distribution are such that I can comfortably carry my hunting revolver all day without undue fatigue or soreness. In addition to fitting me well, the custom holster also fits my Redhawk like a glove. It fits so well in fact that there is no need for a thumb break strap. Retention is accomplished by friction alone. Initially the draw was tight and cumbersome due to the tight fit of the leather, but after a brief break-in period the draw became smooth and fast without compromising the holster’s snug fit. Lucky Gunner was kind enough to provide .44 Magnum ammunition for my hunts this year. This 240 grain jacketed hollow point ammunition manufactured by Fiocchi is a bit light compared to the 300 grain loads I usually shoot, but we’ll see how it performs. Keep an eye out for our review that will be posted here at a later date. Everything looks great except that huge dog-chain snap in the middle of the chest. It will chafe, and perhaps even bruise, the person wearing that holster as he moves about during an active hog-hunting trip. The rock-and-roll of riding a quad will especially cause that hardware to rub. That cross-chest strap needs a protection-flap under that hardware. I’d also lose the speedloaders. For that gun, they are too bulky, and a flat 10-round looped cartridge holder is a better idea. There are several places on that rig to fix it. For balance, carry a water bottle or canteen over there. My custom leather guy here in Gresham, OR, uses hook-and-loop instead of hardware. Combined with good top-grain leather, hook-and-loop makes for strong attachment AND reduced bulk, and it can’t rattle when you’re trying to stealth up on that hog herd. Daniel, of course if you experience any issues that Rivrdog brings up, or any others for that matter, please do let me know and we’ll address them. I’m seriously looking forward to seeing that rig in action later this month. Is there a better color leather shoulder holster for the Ruger Redhawk 5 1/2 44 mag? Like a dark brown.